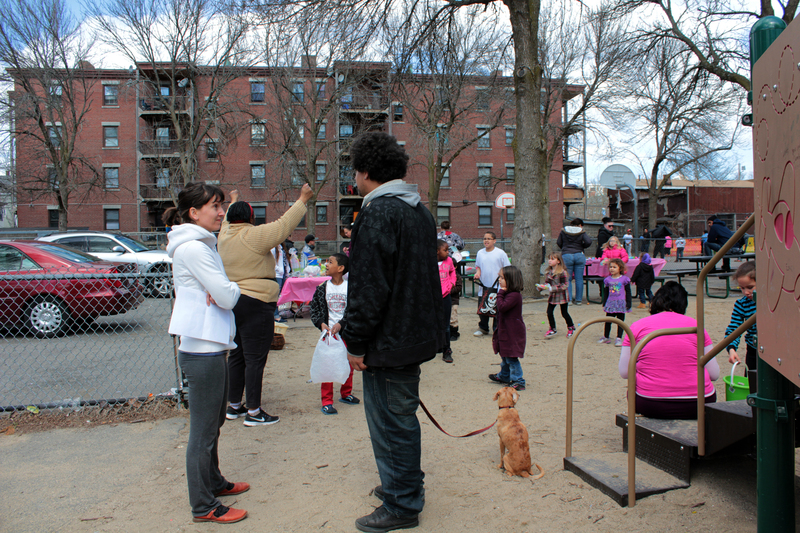 Guest post by Deborah Buelow who reflects on resident participation in Mary Jane Lee Park after last Saturday’s event. The afternoon was quite a success in all aspects: the weather, the turnout, and conversations on how to improve neighborhood spaces. With the first day of bright and warm sunshine beckoning people outdoors and an Easter egg hunt promising the collection of goodies, Mary Jane Lee Park was awash in good feelings. It was an excellent time to ask people to discuss how they view their park, and how they might see it changed. I followed Claudia and the Salem Public Space Project (SPSP) to get a sense of place: who uses the park, what do they like about the park, what could be improved? What about that plot of land next to the park – the one where the dilapidated one story building was located – how would you use that plot now that it’s empty? And in fact that was the idea behind being there yesterday afternoon: to ask people who use this public space to participate in a survey and begin to discuss some of these questions. After listening for a bit I began speaking to people in the context of the survey. There were some overwhelmingly parallel themes running through each person’s voice. One recurring narrative had to do with safety in the park, and how it is used at night. It seems transparency is necessary. Trees have been cut down to mitigate this problem, but more lighting and more openness would help. Another topic related to garbage, litter, overall cleanliness. The ground is dirty, there is no place for trash; the city wouldn’t pick it up if there were trash containers anyway, they said. Could a rubber playground surface help as opposed to the sand? Options are plentiful, but who would implement them? Who would pay for them? These questions, and answers to these questions, lingered, but what really interested me were the overtones that rang throughout these conversations. The people I spoke with initially paused after I asked some of these questions: What else might you do with this park? What would you do with that unutilized plot of land over there? The initial answer was almost always: “I don’t know, I’ve never thought about it.” But somehow that makes sense: if people have no reason to consider an alternate, why would they? This survey works in two ways, and that’s what I find most exciting about it. It will go on to influence a number of ideas that are prompted by the suggestions of the community members, and already I know Claudia and the SPSP have thoughts on how to begin to integrate some of these ideas. But most significantly I see this survey as a way to allow the community members to consider the possibility for change, and to begin to expand their thinking to allow for future improvements. And that’s an opportunity for real and beneficial change. This entry was posted in Dynamic Participation, Salem MA, The Point and tagged neighborhood, public participation, public space questions, social interactions, the point by jellybeancity. Bookmark the permalink.